The department has been gradually shifting towards making more use of centrally managed services which are accessed using a MyCarletonOne account. All desktop pc’s owned and managed by the department are now accessed using a MyCarletonOne account. Math department computer accounts are now only used to access a Math department mailbox or the Turing Linux server. Graduate lab Linux desktop machines and the ottawa and toronto compute servers require an additional Graduate lab account. These labs contain Dell Wyse Zero Client devices that provide a Windows 7 desktop. This is a green technology as the Zero Client devices consume a fraction of the power that a conventional desktop pc would use. All students and instructors must log in using their existing MycarletonOne account. Account passwords can be reset at the MyCarletonOne webpage. The easiest and most secure way to provide course content to your students is to place it in the CuLearn section for the course. Another option would be to have an I: drive created for the course. There is an icon on the desktop that the students can use to map the I: drive for the course. A Minitab icon appears on the desktop. SAS is available in the Course Software folder in the Start Menu. Make sure to save your files to the P: drive. Files saved to the Windows folders (e.g. Desktop, Documents) on the C: drive will be deleted. You have access to the Linux based server turing.math.carleton.ca using your Math department account. Turing provides file storage space and optionally a personal website. You must use SSH to connect to turing, as it is a secure method for remote access. Below are some free SSH software utilities that you may be helpful. Putty is a free Windows utility that allows you to open a terminal on a remote unix/linux machine. WinSCP is a free Windows utility that allows you to copy files to and from your computer and a remote unix/linux server. After connecting, the left side shows the files on your computer, while the right side show the files on the remove Linux server. You may copy files back and forth by dragging them between the left and right windows. Right-click on the remote file, click Properties. You should have at least R (Read) and W (Write) checked for Owner. If you check R for group and other, then everybody will be able to read the file. This is useful for personal website files in Turing’s public_html, or for shared course files on Killarney. Fugu is a free Mac OS X utility that is transfers files to and from a Linux server, using remote SSH. For a course website please consider cuLearn, the University supported E-Learning system. It is much easier to use cuLearn than to learn how to write html! A free alternative is to learn to write your own HTML. Webpages are written in the HTML language, which similar to latex, is a markup language. The printer for faculty and instructors is located in the Faculty Workroom, room 4390HP. The number of pages printed by each School member is tracked for accounting purposes. There is an HP Laserjet P4015x printer in the Faculty Workroom, room HP4390. There are two different print queues that print to this printer. There are two computers in this room from which you may print to the printer. When printing for instructional/departmental use (for example committee notes or master copies of assignments), make sure to choose the HP4390-departmental printer from the print dialog box. To print for research, select the HP4390-research printer and arrange payment with the School Administrator. It is not possible to print to these printers from a laptop. If you have office space with a desktop computer, you may be able to print directly from your office. Technical problems with printing should be directed to Computer Support staff, while questions regarding printer usage and policy should be directed to the School Administrator. The instructions below are for the HP4390-research queue. You may repeat the instructions to add the HP4390-departmental queue. See http://www.carleton.ca/ccs/all-services/computers/site-licensed-software/ for more information on products such as Microsoft Office and Maple. The department has installed SAS in the undergraduate teaching labs for use in tutorial sessions. Contact Computer Support staff if you wish to have a copy installed on your own computer. The department has installed Minitab in the undergraduate teaching labs for use in tutorial sessions. If you need to use Minitab from your office, please contact your Computer Support staff. Matlab R2015a is installed in the teaching labs for use in tutorial sessions. Matlab R2014a is installed in the graduate lab for use in research. The R programming language (http://www.r-project.org/) is installed in the graduate lab. If you require additional R packages please contact your Computer Support staff. We recommend that you use Mozilla Thunderbird to read your email. The free email software Mozilla Thunderbird is recommended for use on your own computer. This is a full-featured, easy to use email client. It does require some setup, describe below. Use this link to download Thunderbird. click on continue to go to the next screen. Thunderbird tries to be clever at this point and figure out the settings. Once the screen settles down, click on the edit button and change the settings to match what is below. You can try “Re-test Configuration” to test it. Once it is correct, click on “Manual Setup”. 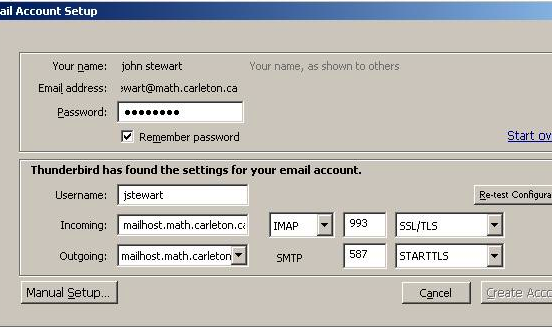 The department operates its own open standards based mail server which provides a mail address of the form account@math.carleton.ca. Mailboxes can be accessed using webmail or by any mail client that supports the IMAP protocol. Alternatively, you can opt to have a mailbox in the universities Office 365 cloud based mail service. If you have a different email application than Thunderbird, then you will need to know the appropriate mail server settings to connect.